Description for this lot ran a bit long (that's what I get for trying to make a realistic-seeming article about a fictional colony! ), so if all you need is the technical info, it's at the bottom after the last image, as per usual. 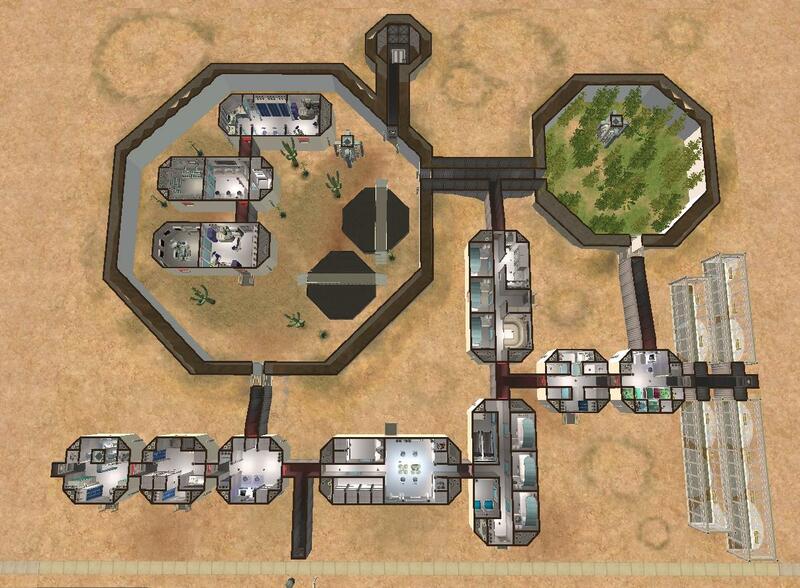 While the station is designed to conduct a variety of scientific experiments, its primary functions have been to prove the habitability of Mars, demonstrate the practicality of in-situ resource manufacturing, provide a manned base of operations for further exploration of the Red Planet, and begin the long process of terraforming Mars. Having been operational and occupied for a consecutive total of 11500 sols, Galileo Station far exceeds any other extraterrestrial structure in length of time inhabited. The first plans for the permanent Martian colony that would eventually become Galileo Station were drawn up in Fall of 2020, shortly after the first successful test of SpaceX’s Red Dragon spacecraft. The initial concept was to use components delivered by Red Dragon spacecraft to imitate the modular design of the International Space Station, with the station becoming semi-operational long before construction was completed. The location of the station was determined by a preliminary series of 4 manned missions following the outline of the Mars Direct program. The first module deployed at the selected site was the Galileo Crew Module in spring of 2033, named after Italian astronomer Galileo Galilei, who was the first astronomer to view Mars through a telescope, marking the beginning of modern scientific study of the planet. 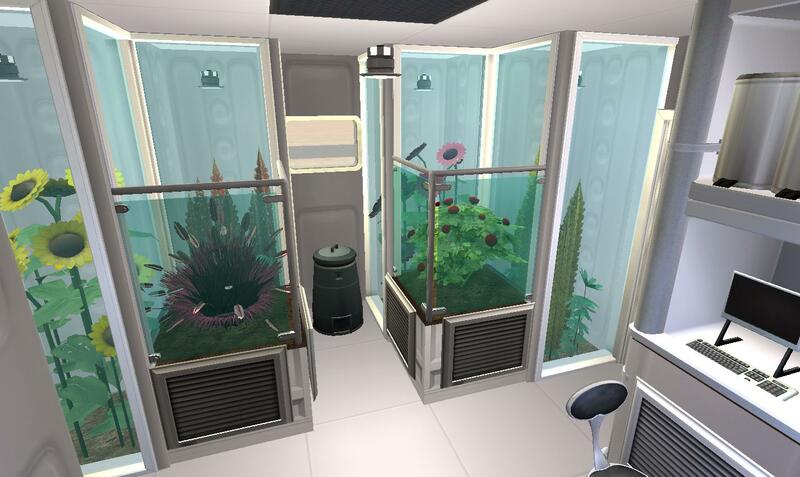 This module was quickly joined in the fall of 2033 by the Clarke W&H (waste and hygiene) module, named after science fiction author Arthur C. Clarke and housing the station’s toilet and bathing equipment, and the Percival Lowell Martian Botany Laboratory in spring of 2034, named for Percival Lowell who first popularized the idea that Mars was inhabited around the turn of the 20th Century through his (incorrect) assertion that the Martian surface was crisscrossed by a series of canals. 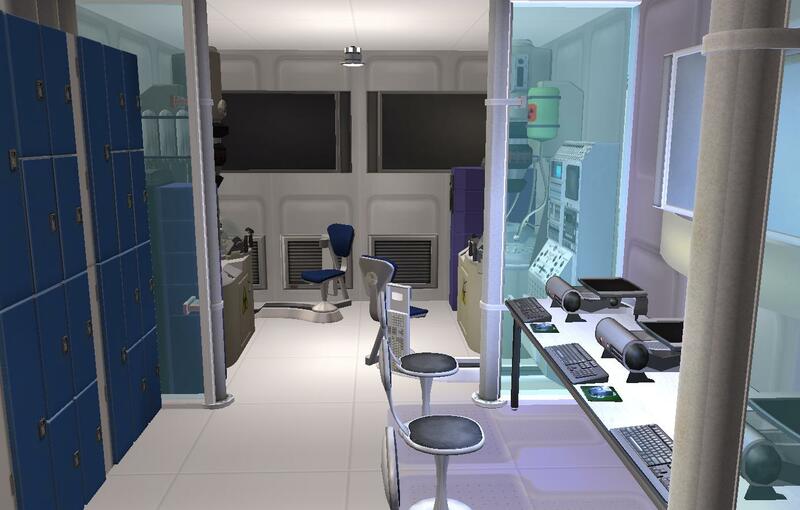 This lab is specially designed for the simulation of conditions resembling those on the Martian surface, allowing genetically-modified organisms to be examined in a laboratory setting before being released into the Martian environment as part of the terraforming effort. With the activation of these three modules, and an initial array of 24 solar cells for power, Galileo Station saw its first crew of three, (Galileo Station Mission 1, or GSM1)stationed on the planet for 18 Terran months before returning to Earth, having been relieved by the crew of GSM2, who would again spend 18 months before being relieved by GSM3. 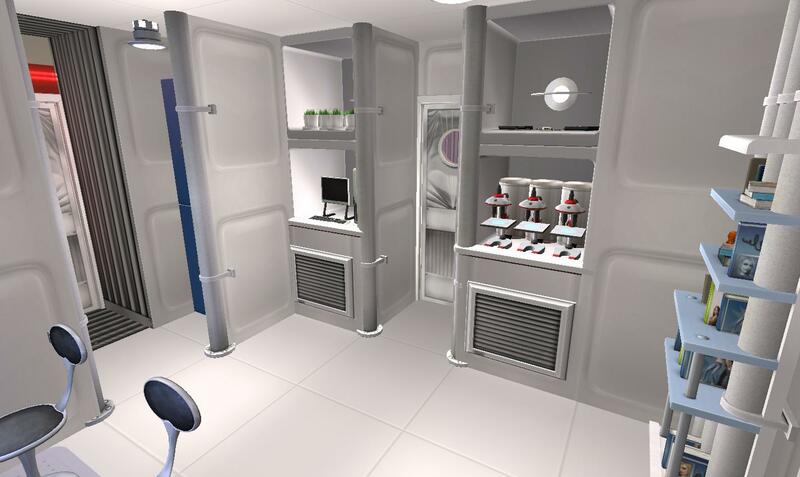 During this period, the station was dependent on supplies and consumables shipped from Earth, as there was not yet a large enough facility to produce many of the resources on Mars itself. During the GSM2 and GSM3 missions, several additional modules were deployed on the Martian surface in both active and inactive states, due to the limitations of the active modules. The Aldrin Crew Module was the first addition in 2036, named after Apollo 11 astronaut and outspoken supporter of Martian colonization efforts Buzz Aldrin, followed by a series of rigid inflatable greenhouse modules whose names were chosen from a list of 150 fictional space explorers in a contest open to elementary school students throughout the participating nations. The four greenhouse modules are (clockwise from top left) the Kirk Greenhouse, named for the fictional Star Trek captain James Tiberius Kirk, the Marvin Greenhouse, named for the animated character Marvin the Martian, the Reynolds Greenhouse, named for the character Malcolm Reynolds from the short-lived television series Firefly, and the Skywalker Greenhouse, named for Star Wars character Luke Skywalker. With the addition of the 72m2 of arable land from these modules, Galileo Station was equipped to begin providing more of its own resources, particularly food. 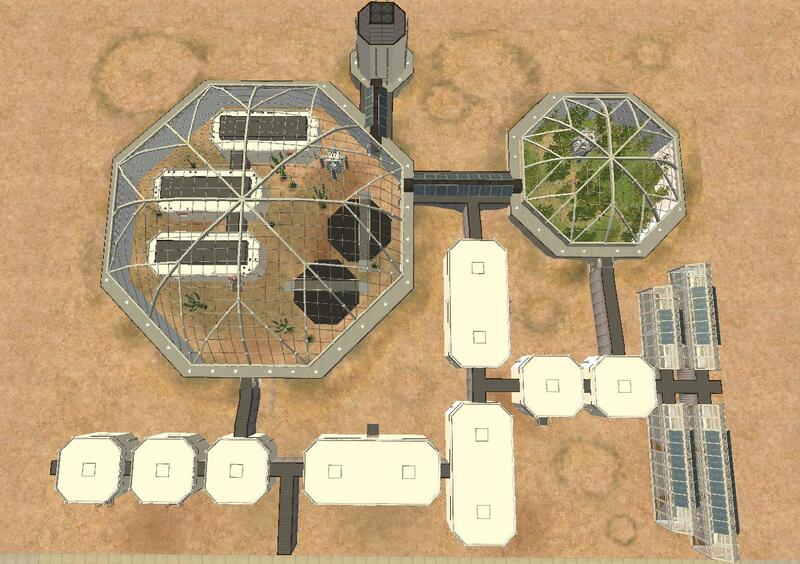 The greenhouses use Martian regolith amended with the organic matter reclaimed from the station’s waste processing systems, as well as colonies of terran microbes, which allow for sustainable on-site growth of a variety of crops. The addition of a larger number of plants scrubbing CO2 from the Martian atmosphere and releasing O2 into the atmosphere within the station ecosystem also relieves some of the pressure on the air filtration system, further allowing the station to function independent of constant supplies from Earth. In 2041, the Pathfinder Areology Module (named after the Mars Pathfinder and Sojourner Rover mission in 1997) arrived with the crew of GSM5, providing Galileo Station with a dedicated areology (geology comes from the Greek Geos, meaning “Earth,” so areology uses the Greek Ares for Mars, but both refer to essentially the same scientific discipline) laboratory, allowing for much more in-depth study of Martian rocks and rock strata than had been possible with any Mars mission up to that point. Also delivered in 2041 was the Schiaparelli Areography Module, named for Italian astronomer Giovanni Schiaparelli. This module serves as a data compilation and storage center for the ongoing efforts to more thoroughly map the Martian landscape for future use, as well as functioning as a storage space for various laboratory equipment needed as Galileo Station’s various scientific missions are expanded. 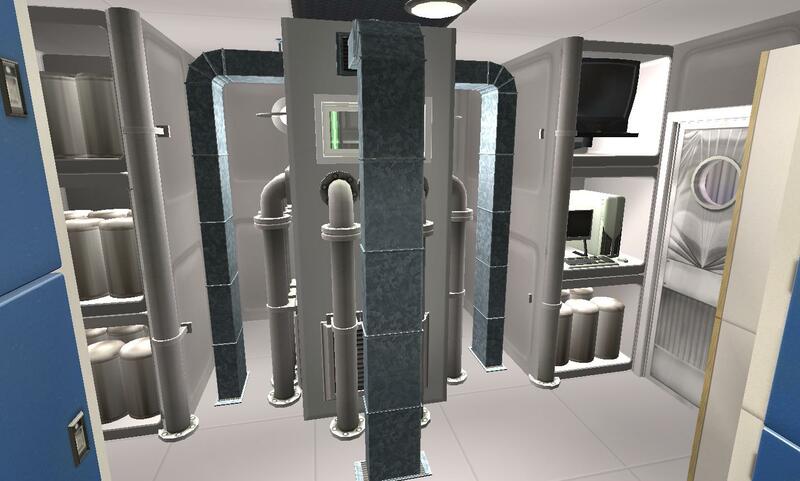 Between those two modules was an extended connection passageway, designed to be depressurized and connected to exploratory and transportation vehicles to allow for easier access to mobile platforms for various missions. These twelve modules completed the initial design of Galileo Station, and GSM7 through GSM10 carried out their missions using the resources found in these modules, with crew sizes varying from 3 to 6 until GSM8 established the staggered 36-month mission, with 6 crew members posted at the station except at mission ends and beginnings, when the three senior crewmembers would return to Earth, being replace by a new crew of three. Mission windows were then identified by the mission of the three senior crew members. As the understanding of in-situ resource utilization grew, pressure grew for the space agencies managing the station to produce more of the equipment needed for missions on Mars itself, to avoid the astronomical costs associated with regular uncrewed rocket launches between planets. This proposal met with great success, and it was proposed that the station again be expanded. 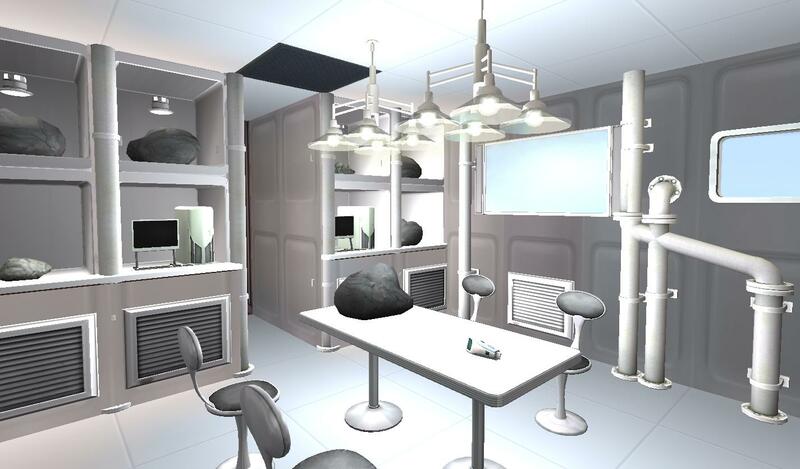 In 2051, during GSM11, construction began on the footings for the Robinson Dome, connected to the Lowell Biology Lab. This dome was named for science fiction author Kim Stanley Robinson, whose works are often cited as some of the finest examples of terraforming projects in fiction. 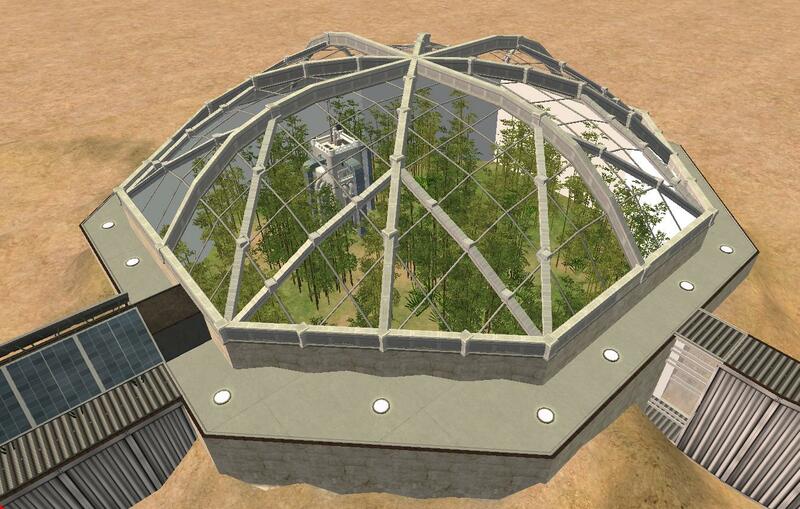 This dome has concrete made primarily from Martian sands as its foundation, with a microfine lattice of an acrylic polymer used to contain an atmosphere that can be pressurized to up to 1.2 atmospheres. 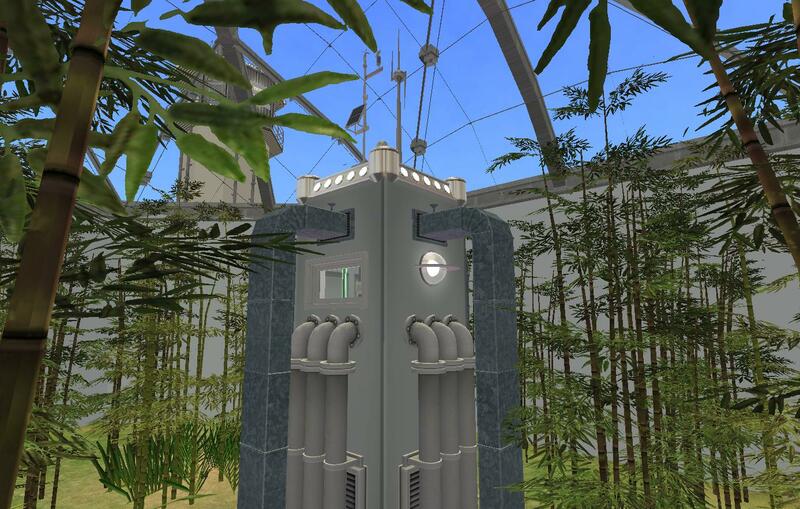 This dome is used primarily for larger-scale crop growth, with its current (and longest running) purpose being the cultivation of a hybridized Martian bamboo, genetically engineered to grow at much lower temperatures and pressures than common terrestrial bamboos. It is hoped that this hybrid may be useable as a building material for future station construction. The dome is pressurized using a modified version of the Environmental Control Unit that maintains the atmosphere within the primary modules of Galileo Station. The success of the Robinson Dome prompted the agencies involved to draw up plans for a second, larger dome, named the Ares Dome, after the Greek name for Mars. 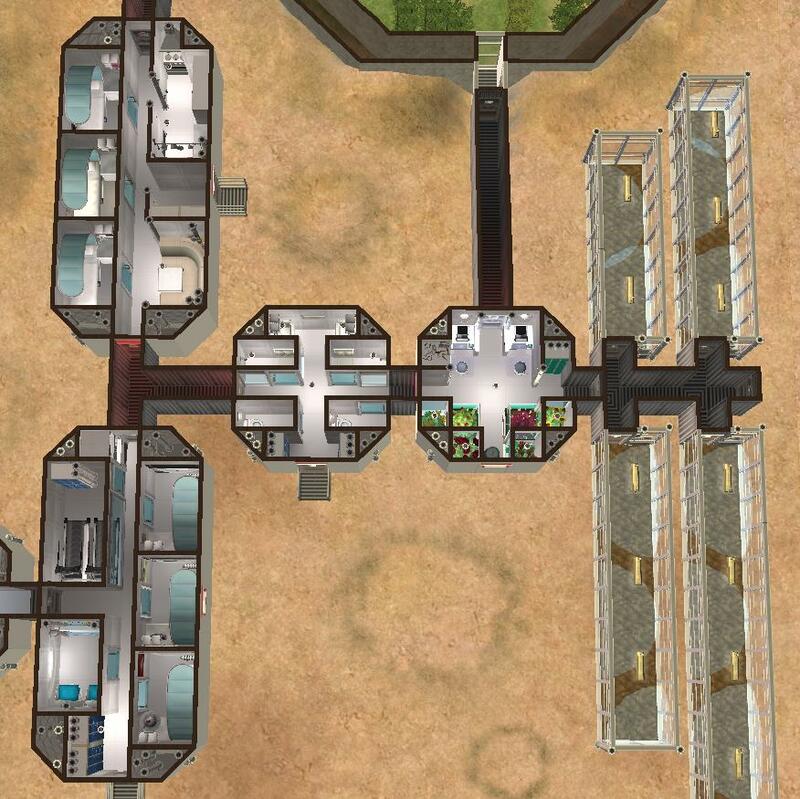 A series of minor medical emergencies among the crew also prompted discussion of the need for a more substantial medical facility, so prior to the construction of the dome itself, three new modules were sent to Mars in late 2054. Each of these modules was named after one of the early 21st Century rovers to have explored the Martian surface. 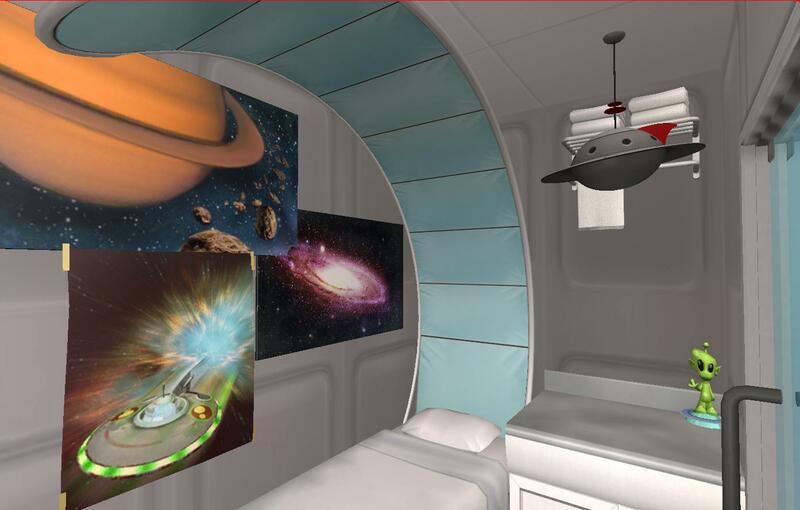 The Spirit Module, named after the Spirit MER serves as a dedicated medical facility, complete with operating room. The Opportunity Module, named after the long-lived Opportunity MER, twin to the Spirit Rover, houses a hydroponic greenhouse and wet lab, allowing for experiments to be conducted studying the differences between water-based organisms on Earth and on Mars, furthering the terraforming effort. 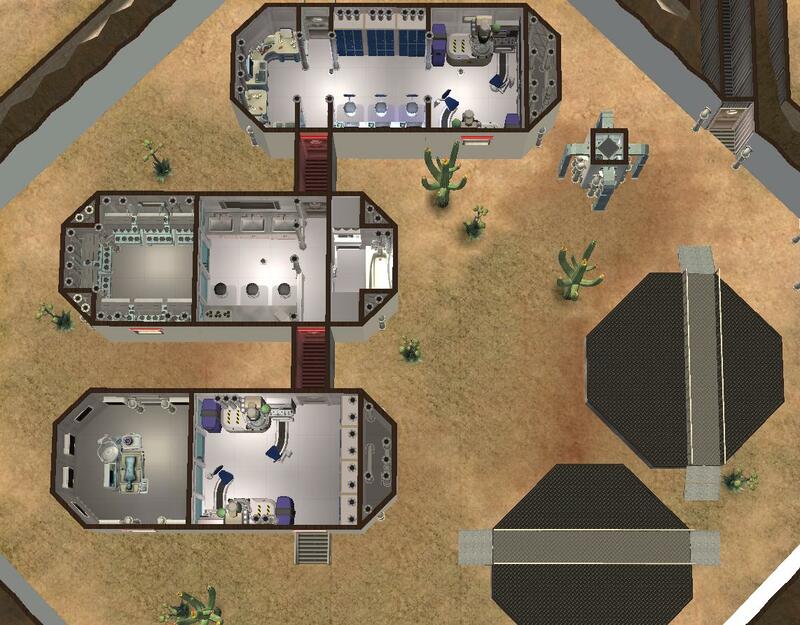 The third module is named after the Curiosity Rover, and houses Galileo Station’s dedicated microbiology lab, designed to bioengineer organisms better suited for life in the Martian environment, from the microbial scale all the way up to a human scale. All three of these modules were designed to function within a pressurized dome, so they do not have life-support facilities on the same scale as the modules that make up the primary components of Galileo Station. 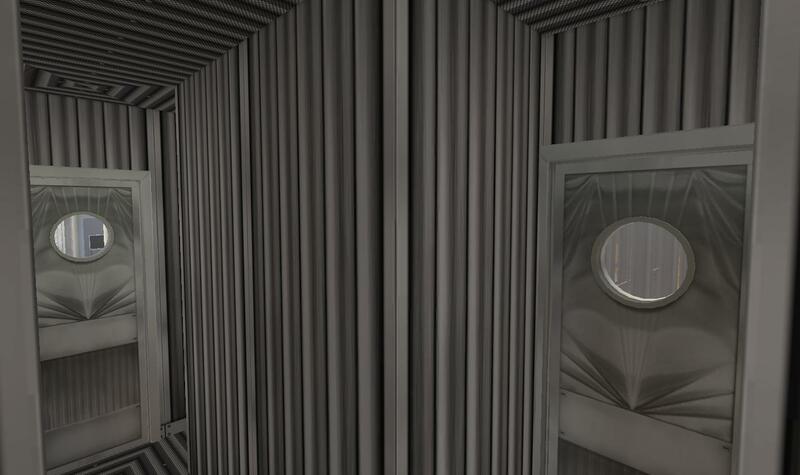 Because of this, these three modules were left inactive until the completion of the Ares Dome in 2059. The Ares Dome itself also houses the station’s water storage tanks. Water is processed out of the Martian regolith, obviating the need to have it sent from Earth on a regular basis, and is used for drinking, cooking, bathing, and scientific missions, but also electrolyzed into pure oxygen and hydrogen, for use in the station’s atmosphere and as a fuel and reactant source. Like the Robinson Dome, the Ares Dome has its atmosphere maintained by a modified Environmental Control Unit. 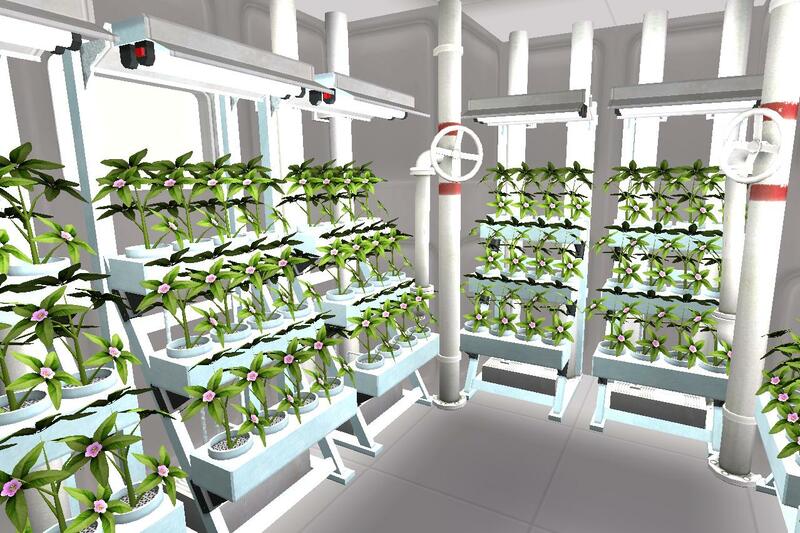 The interior space of the dome is used as a controlled environment, much in the same way the units of the Lowell Botany Module are, but on a larger scale. Within the dome, several genetically modified species of desert organisms from Earth are being tested for hardiness in the much colder temperatures of Mars. 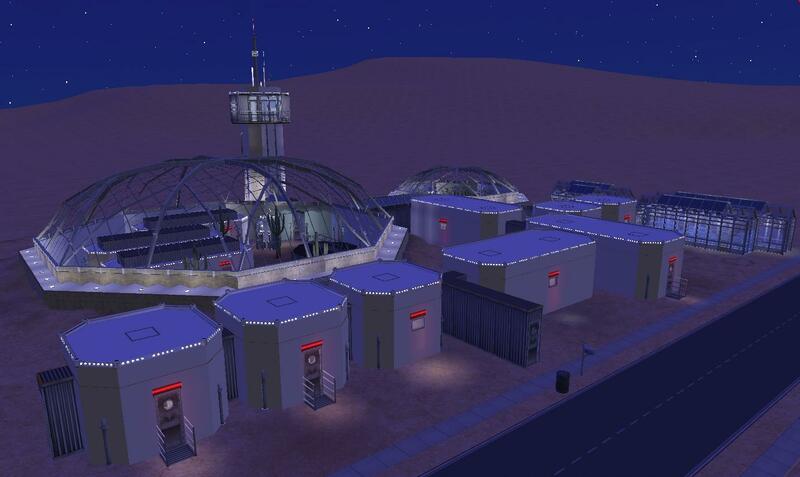 With a larger crew permanently on site, and a much wider array of resources available for conducting missions, Galileo Station began to be used as a base for more exploratory missions in the surrounding areas. Due to the smaller diameter of Mars when compared to Earth (only slightly more than half as wide), line-of-sight communication is impractical without an elevated location on which to mount antennae. To address this problem, and expand the range within which communication would be possible, a communications tower was built during GSM13, with a dedicated module being sent, placed on top of a spent rocket stage to provide it with the appropriate elevation. Completed in 2062, this communications tower is the most recent addition to Galileo Station. Every module can be isolated from all other modules in the event of a pressure failure, and EVA suits are located in several separate locations, allowing station crew to address issues that may occur with equipment not located in pressurized areas. 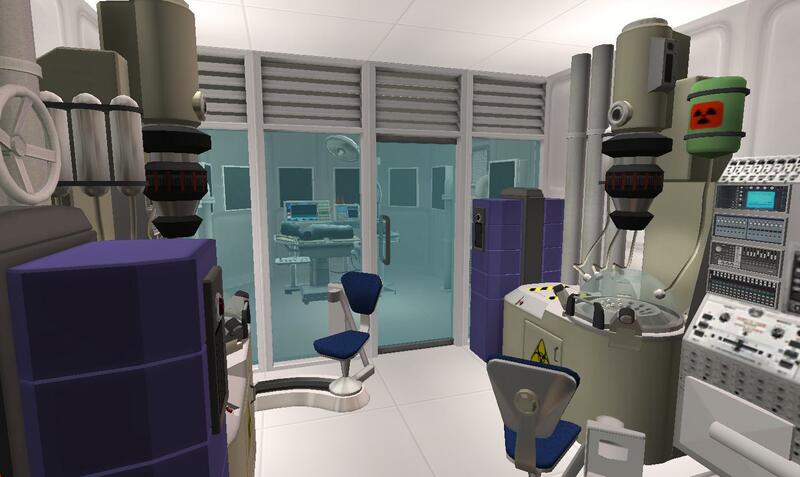 The station is powered entirely by solar power, with the Sabatier Reactor providing a backup. 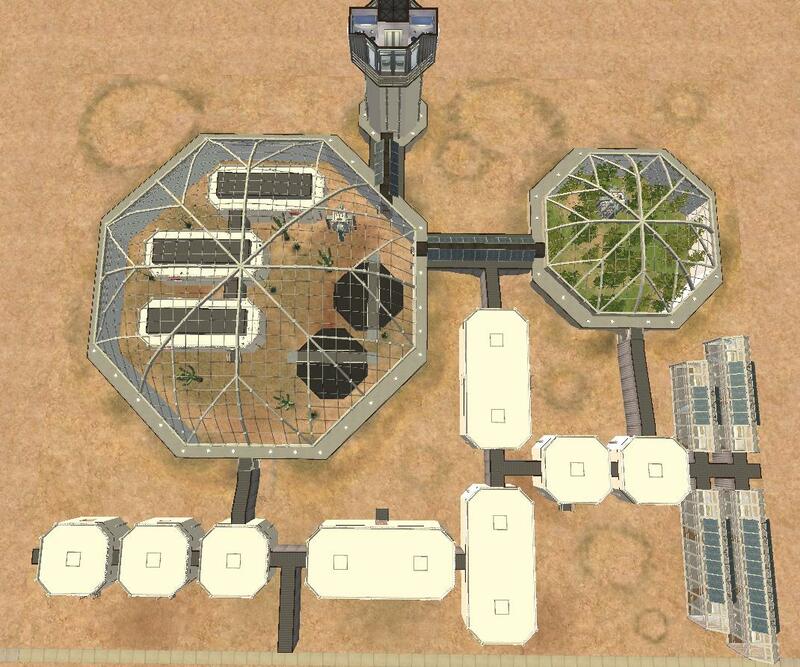 This, plus the fact that water can be processed out of the surrounding landscape, and food grown inside the greenhouse modules, allows the station to function more-or-less independently from Earth for extended periods of time. The space agencies involved in the project are currently in talks for an indefinite mission, to prove the long-term habitability of Mars with currently available technology, and to allow for more extensive off-site construction using local resources. OK, that wraps up my wanna-be Wikipedia article of a description! I’ve had a lot of fun trying to make a lot that would actually work on Mars given current scientific theories, and I wanted to explain my thought process a bit more than a normal description is really open to. I also linked to all sorts of different Wikipedia articles if you’re interested in learning more about the people and missions that modules were named after, or the real-world processes that could (should) be used to sustain life in an environment as harsh and unforgiving as Mars’s. Now on to the normal technical stuff (i.e., technical within the game rather than technical on Mars! ) This is a pretty big lot, no question, but the fact that most of it is on the first level and there is no outdoor flora or decoration helps make for a much faster-running lot than you might expect. The in-game price is $640,392, so if you’re pretending that it’s an actual mission, just add on about six more zeroes! As usual, no CC whatsoever is found on this lot, so you won’t have to go hunting for anything extra if you want to download it. There are several items conspicuously absent from this lot as well- you’ll notice there are no phones, burglar alarms, or fire alarms. The reasoning for this is simple- Mars is too far for a telephone conversation to take place in anything close to real-time, and it’s downright impossible to invite someone over (unless they’ve got a private rocket, and about 18 months of free time on their hands!). The same goes for calling the police or fire department- Mars isn’t exactly known for having a lot of public services! There are sprinklers located where fires are a possibility however, so fire shouldn’t be too much of a concern. As for burglars… I have no idea- make something up! Of course you’re also free to add in these appliances if you’re using this lot as part of an established colony or something too! A few tips if you choose to make any Build Mode modifications to the lot… the smaller dome’s CFE work is temperamental for some reason, and if you place any walls or tall fences or columns (read: anything that creates floor tiles above it), there’s a good chance you’ll distort the dome pretty dramatically. (What can I say? 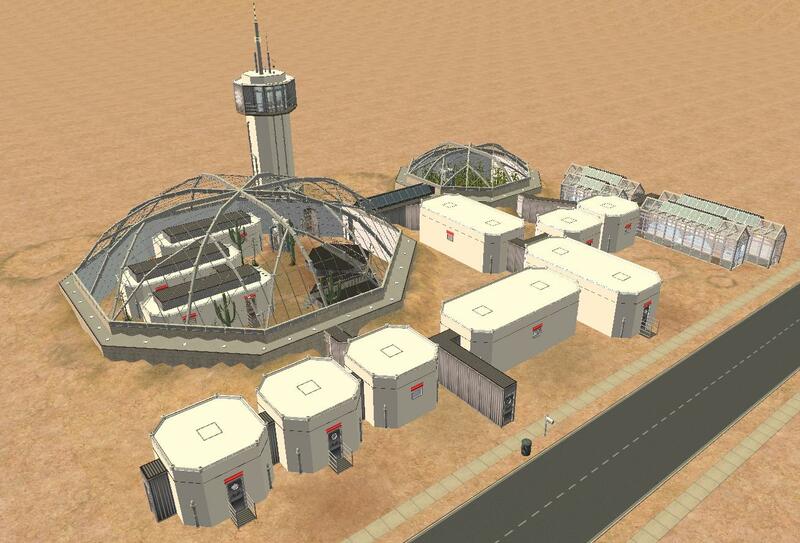 CFE gives you some pretty impressive structures, but it doesn’t play well with others!) The larger dome seems largely immune from these problems on the ground floor though, so long as you’re building a few tiles away from the edge. 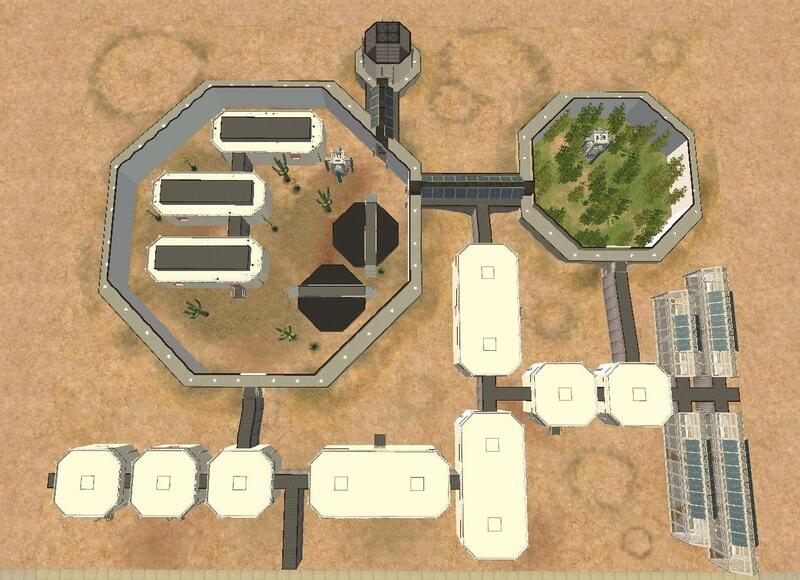 Both domes are considered “outdoors” by the game engine, since they’re not entirely enclosed by walls or foundations. 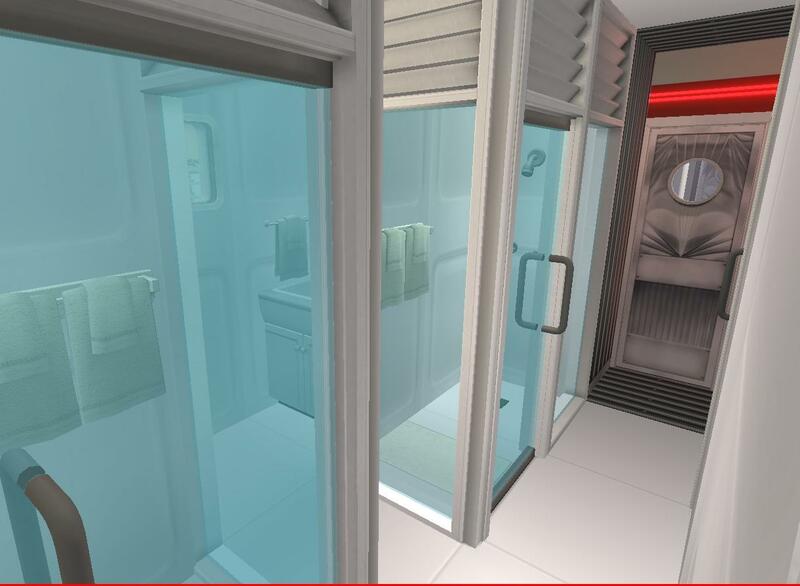 Each connecting passage between the dome and the external station modules uses a segment of greenhouse walls and doors, so that the domes are properly sunlit, instead of being shadowed like indoor rooms are. 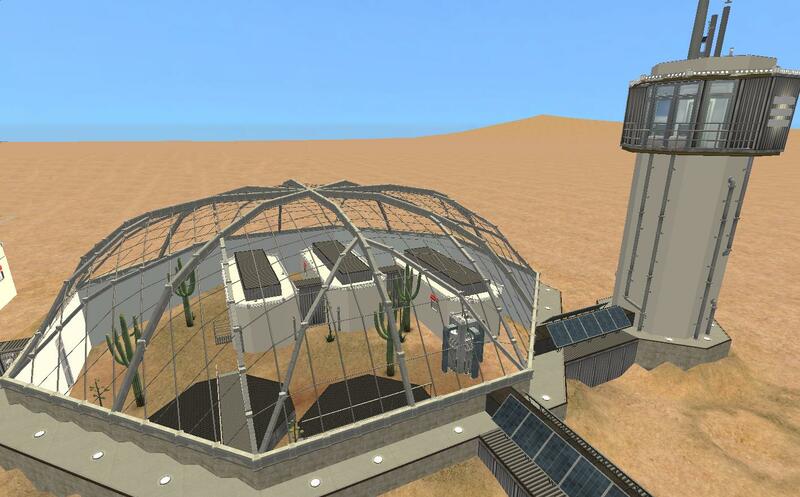 (This is also why there are enclosed spaces between the external modules and the domes that still function as normal outdoor spaces) The greenhouse doors still function like normal doors, and I didn’t find any routing errors with them either. Another word of caution- for whatever reason (again, probably something to do with CFE), constructing new spaces entirely enclosed by walls (or removing walls to open up enclosed spaces) takes a ridiculously long time, but it DOES still work. (interior walls can be built or destroyed without any odd length of time) If you’re working on expanding something on this lot, just be aware that you may have to let the game think for a minute or two before you can do anything else. Kind of a pain, but it still works fine, just slower. Finally, since I was having so much fun with this lot, I did even more thorough playtesting of a clone of it than I usually do. Surprising me somewhat, I ran into virtually no trouble anywhere, so you should be able to play this lot without anything seeming odd, but there are just a few things I want to mention- in several modules, the shelves have computers on them- these cannot be used, they’re pretty much just there as decoration. Same goes for everything on the shelves, I suppose, but the computers are pretty much the only thing it seems like you’d try to use. As always, if you run into trouble with anything on this lot, let me know, and I’ll do my very best to fix it. Enjoy! Thanks to the people involved in this thread, for first implanting in my head the connection between MTS and Mars! Also, since the inspiration for this lot comes in large part from wanting to iron out starting details for a challenge I’m trying to write, and since Phaenoh has been a huge help with guiding me in the beginning stages of that project, thanks to her as well!